In this tutorial, I’ll let you know how to easily show or hide WordPress Gutenberg Editor Blocks on mobile devices, tablets, and desktops. Every content writer focuses on their readers’ good “user experience”. One of the ways to ensure this is to have a very good page layout, especially on mobile devices. On most cases, mobile page layouts are very cluttered, especially when you have a lot of blocks to choose from. You can now easily have option to fix it and hide any block you want on mobile devices. With the new WordPress Gutenberg Editor, you can now manage every content better with the use of blocks. To improve block management, the only plugin you’ll be needing is Block Options, which is available for free on the plugin directory. One of the best Block Options’ features is the ability to show or hide specific blocks on mobile devices and desktops. Read on to know how easy it is to manage blocks per device. Just follow the few and simple steps below and you’ll be done in no time. 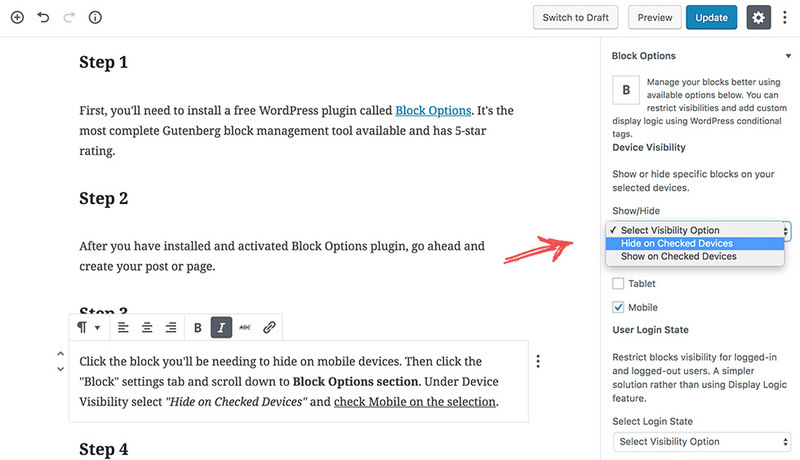 First, you need to install Block Options, a free WordPress plugin. It’s the most complete Gutenberg block management tool available and has 5-star rating. After you have installed and activated Block Options plugin, go ahead and create your post or page. Click the block you’ll be needing to hide on mobile devices. Then click the “Block” settings tab and scroll down to Block Options section. Under Device Visibility select “Hide on Checked Devices” and check Mobile on the selection. Continue creating your other contents, and just repeat the step if you need to show or hide any block on mobile devices, tablets and even desktops. Then, click the Save button. And that’s it! Super simple. If you want to explore more Block Options features, just go to Settings > Block Options. As always, feel free to leave your comments below. Enjoy creating your content using this brand new tool! Increase user engagement and get better conversion rate! Check how you can transform your widgets into Modal Pop-up, Slide in and/or Sliding Panel! Manage your WordPress Editor Blocks better...What are you waiting for? Please enter a valid e-mail address. We will also be sending product updates. We do NO SPAM, promise!